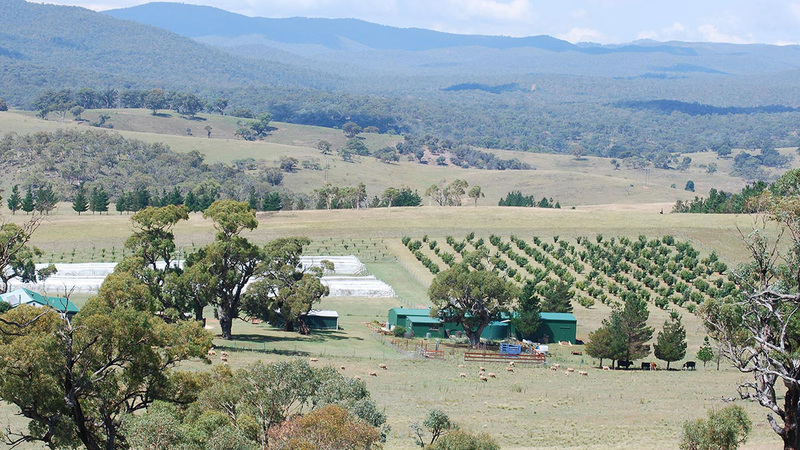 Located in the NSW Southern Tablelands north of the Snowy Mountains and just outside the village of Bredbo, Macenmist Black Truffles and Wines are proud to have created a farming oasis that sustains our needs and contributes to the needs of others. When Richard and Barbara purchased the property now known as “Macenmist” it was in a sorry state. Apart from a run-down shed and a few gum trees, there was nothing on the land except weeds and litter. There was little in the way of native flora, and the fauna consisted of Eastern Grey Kangaroos and a few birds. In 1996 the clean up, land restoration, and erection of dwellings commenced. There was a lot to be done and priorities shifted daily. Rabbits and their burrows needed to be eradicated, the feral animals had to be removed and then there was the need to establish dwelling facilities with all the usual utilities such as electricity, water and sewerage. As part of the land restoration 38 hectares were devoted to trees. A Radiata pine plantation was planted followed closely by the planting of 10,000 native species. Today, the pines are home to Black Cockatoos who feast on the pine nuts, Wedge-tailed Eagles soar the sky’s and the open lands are home to a plethora of other native birds and animals. Two hectares were devoted to the homestead and garden which provides a playground for the Macenmist dogs. A Sparrow Hawk also calls the area home along with other bird species that have returned to the area to live or visit as part of their migratory pattern. We now welcome Magpies, Parrots, Wrens, Kookaburras and the colourful Rainbow Bee-eater to name just a few. Macenmist planted its first vines in 2000 then a few years later after investigating the merits of the Perigord black truffle preliminary work was undertaken to establish an area suitable for a truffiere. The land was worked up and the numerous rocks were laboriously picked up and removed prior to the addition of lime.